Looking for a double stroller that does it all? 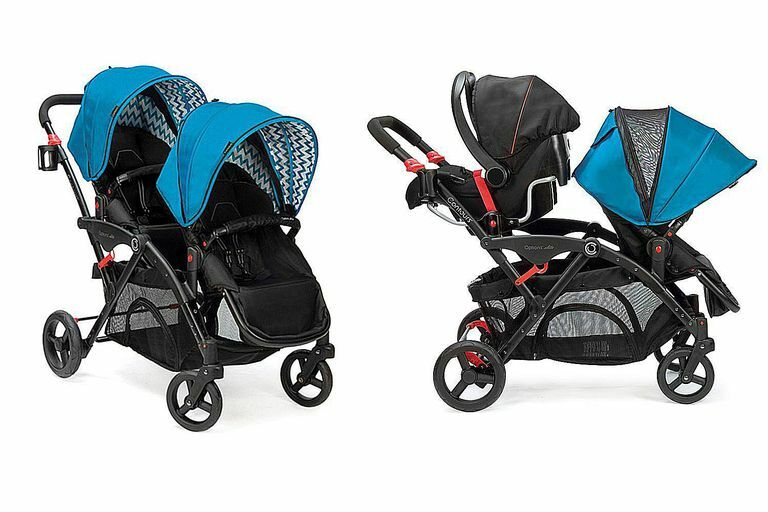 The Contours Options Elite tandem double comes pretty close, and at a much lower price than most other full-featured double strollers. This stroller offers seven different seating configurations, so your babies can always be comfy. Let's review the Contours double stroller features. Stroller dimensions (open) - 49.5" x 39.5" x 26"
Stroller dimensions (folded) - 38.5" x 21" x 26"
At around $300, this certainly isn't a cheap double stroller, but it's important to note that you can spend hundreds more on a​ stroller with fewer features. It's definitely the best-priced tandem double with reversible, removable seats and the ability to hold two infant car seats. The seat configurations are the best feature of the Contours Options Elite. The two seats operate completely independently of one another. Some double strollers require you to recline both seats or to use one sunshade to cover both seats. Not so with the Options Elite. Every adjustment, from sunshade to seat recline and footrest settings, is independent, so you can easily accommodate each child's preference (or nap time). The seats are also removable, which allows you to use this stroller as a single with a massive shopping basket, or you can take the seats off to add an infant car seat adapter on one or both seats to create a travel system. An infant car seat adapter is included. The adapter is universal, so it will work with almost any infant car seat brand. Chicco, Graco, Combi, Evenflo, Britax, Maxi Cosi, Cybex, Baby Trend, Peg Perego, Safety 1st and UppaBaby infant seats all work with the adapter. If you have twins, you can buy a second adapter for about $30. The storage basket is huge. Any diaper bag will fit in there, along with just about anything else you may need. It can be a little bit hard to reach in the basket when the seats are in certain configurations, but not any more difficult than with other big strollers. Contours added a side zipper on the basket to address that problem. The fold is fairly easy for a large stroller. You squeeze the triggers on the sides of the frame and push toward the ground until it locks. The stroller stands by itself when folded. It would be nice to see a one-hand fold mechanism on this stroller, but this one feature is not a reason to bypass the Contours Options double stroller. The steering is about what you would expect for a very long, heavy stroller. It's not going to turn on a dime, but it's easy enough to get around corners (slowly) and you'll easily fit through standard doorways. The frame is quite sturdy and holds up well, even with two bigger kids in the stroller regularly. It's enormous, to start. All of those options are heavy, to the tune of 38 pounds. You may need to do a few months of weight lifting to prepare for hauling this stroller in and out of your trunk. The folded dimensions are also pretty big, 38.5 inches by 21 inches by 25 inches, so you need to leave plenty of room in the trunk to stash the stroller. The parent console and child snack trays are not included with the stroller and must be purchased separately. With a $300 stroller, it would be nice to not to need to spend another $100 for accessories that lots of cheaper strollers include. However, there are many other flexible stroller organizers, cup holders, and snack trays available to add storage to the stroller if you don't like the ones available from Contours. It's fairly easy to customize your baby's ride. The way the basket runs under both of the seats, anything the kids drop will end up in the basket. That's great if it's a toy that is dropped. When it's french fries and cookie crumbs, the basket gets dirty quickly. Overall, the Contours Options Elite tandem stroller is a very good option for two kids. It's one of the best and lowest costing tandem doubles on the market today. It works equally as well for twins as it does for an older child and a newborn. The reversible, removable seats mean this Contours stroller truly lives up to its name: options.